In 2016, at our inaugural edition, we showcased “NAVEGANTES DEL SUEÑO,” an exclusive collection of Wixarika (Huichol) art that gathers unprecedented never-before-seen works, reflecting the cosmovision of this mystic community. 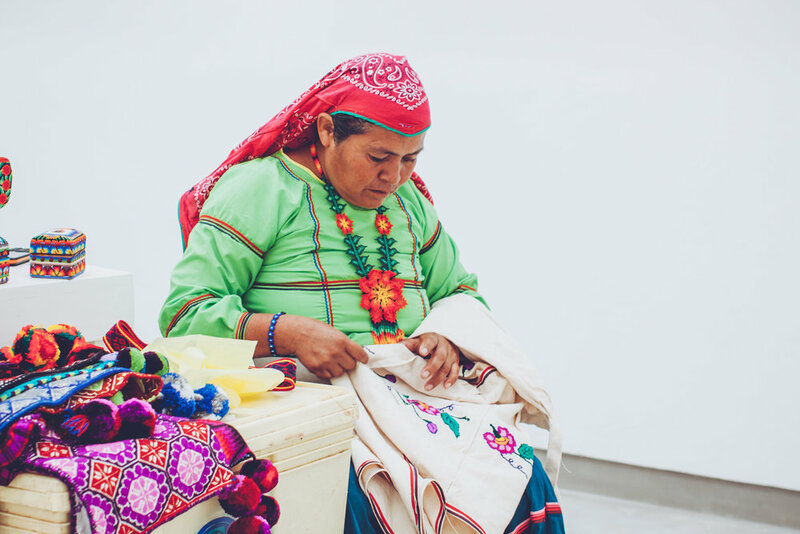 For the first time, authentic Huichol masterpieces were exhibited at Ondalinda x Careyes, including works by some of the most famous Huichol artists. Ondalinda x Careyes had the privilege to display a special mural representing traditions and rituals of the Huichol community. A Huichol shaman and his musicians performed a ritual at the opening of the exhibition to invoke the Gods and bless the event. Special artisans were present selling their unique creations and crafts with 100% of the profits going directly to them. A large portion of the art was available to purchase and all the sales went back to the Huichol communities. Here, we proudly received over 300,000 pesos (approx. 20,000 USD) in profits thanks to the art gallery exhibition and craft sales. The money raised had a direct and highly effective impact on their communities, allowing them to invest in basic resources and infrastructures, achieving sustainability on a long term basis. The Ondalinda Foundation was also able to target social and cultural impact as the Huichols had an opportunity to share and promote their culture and traditions on a worldwide level throughout the event. Our first edition also included the screening of the multi-awarded film “Eco de la Montagna” and a talk led by a world-renowned Huichol expert, Humberto Fernandez, along with the 35.000 community leader, Santos de la Cruz. The Huichol are among the last indigenous groups in Mexico who have successfully preserved their spiritual identity. The tribe dates back to the Mesoamerican era and consists of close to 35,000 people who live in the Sierra Madre Occidental region of Mexico. This community sustains themselves as farmers in a terrain that they consider sacred. They maintain their eco-systems with profound sensibility towards nature and celebrate the unity between man and nature in an extraordinary spiritual legacy that has been passed down by generations for thousands of years. In their ancient shamanic tradition, the Huichol to this day worship Gods who represent forces of nature and advocate a peaceful conduct with the gifts of nature. Huichol art reflects astonishing cultural sophistication and serves as expressive manifestation of their spiritual devotion. Each artifact is unique and reveals most meticulous artisan craft: evolving from sacred votive objects, they are elaborately decorated with glass beads. Shining in bright color palettes, the distinct ornamental aesthetic of Huichol art echoes their joyful ceremonialism and has served as an important influence on Mexican modernists such as Diego Rivera and Frida Kahlo. In the 1950s Huichol art attained world renown by traveling galleries and museums throughout the world.